I received this book as part of a Goodreads First reads promotion. I am a big fan of Loreen Niewenhuis's books regarding the Great Likes regions.n this book she explores the Islands of the Great Lakes via walking, biking, hiking and kayaking. She celebrates the uniqueness of the islands she visits and makes one want to reenact all or part of her journey. I received this book through a Goodreads Giveaway (and I'm so glad I did! ).I'm a Great Lakes girl and learned so much more about them from reading this book. Loreen tied geology, history and travel into a very entertaining and educational read. I especially enjoyed how she got involved in projects/events on some of the islands - the re-creation of the Civil War battle on Lake Erie, the Moose Watch study on Isle Royale. I must now visit some of these islands and read Loreen's previous "1000-Mile" books! Loreen Niewenhuis - Loreen Niewenhuis grew up in Michigan and has lived there most of her life. She pursued a life of science, getting a Bachelor, then Master of Science degrees. She worked in various aspects of that world including a hospital laboratory, basic animal research, and a bone marrow transplant group.While taking a break from this work to raise her young sons, Loreen began writing fiction. This evolved into a passion and she returned to school to get her MFA from Spalding University.Her short story collection, Scar Tissue, was a finalist for the Flannery O’Connor Award in 2009.From the time she was a young girl climbing sand dunes and splashing in its cool waters, Loreen has felt connected and drawn to Lake Michigan. She decided to explore the lake fully by walking around it. The fascinating account of her journey, A 1000-MILE WALK ON THE BEACH, was published in 2011 by Crickhollow Books (Milwaukee, WI).Loreen’s novella, Atlanta, was be published in 2011 by Main Street Rag Publishing (Charlotte, NC).In 2012, Loreen took another long walk: a 1000 mile hike touching all five Great Lakes. 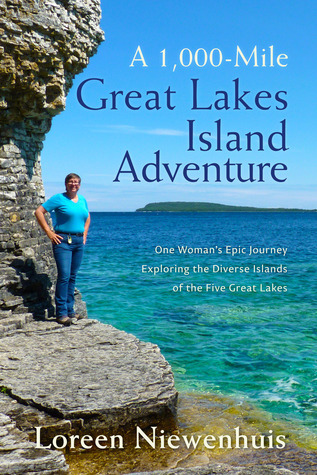 The book about her latest adventure will be released in 2013 by Crickhollow Books and is titled: A 1000-MILE GREAT LAKES WALK.Currently, Loreen is on her third Great Lake Adventure, this time exploring the islands of the Great Lakes. The book about this journey will be released in 2015.Long before she was a writer, Loreen was (and still is) a reader. Feel free to 'friend' her on Goodreads.